on 28 March 2009 (Saturday) at 8.30pm until 9.30pm lets switch off our lights! 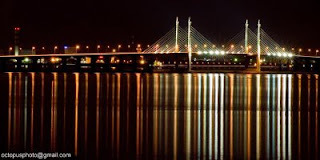 One of the longest bridges in the world and in Malaysia will be going dark for one hour in support of Earth Hour! "Switching off your light is a vote for Earth and living them on is a vote for global warming"
p/s: i'm just ONE person.. but TOGETHER we can make a difference!